By Nicole, brought to you by Kamik! Oh boy, it’s getting colder! Fall is so fleeting here in Utah and try as we might to enjoy every second, it always seems to slip away! Adventuring is easy and so amazing in the Fall we’re doing our very best to keep it up even when the Winter hits! Skiing, sledding, snowy hikes, whatever it takes! I worked with Kamik via Zappos to get my boys all set for whatever this weather might throw at them. Kamik is a new-to-us brand and the thing that impressed me most right off the bat is how they’re super sturdy and waterproof, but not heavy! I also love that the shaft of the boot is nice and tall but basically made of canvas so it doesn’t add weight or bulk but still keeps the elements out. We snagged this pair and love them! 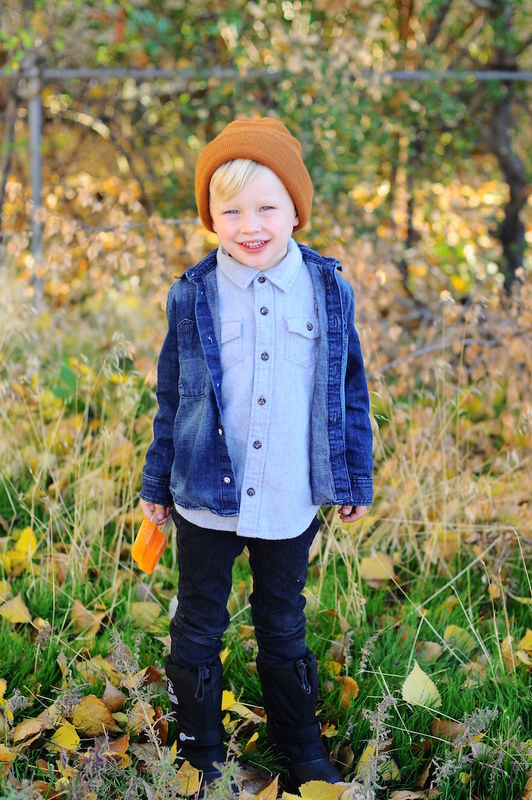 Dressing my boys in the colder months means beautiful jackets, warm knitted accessories like scarves and hats. And soft (not itchy though!) sweaters for layering. And a new favorite, denim on denim! Try it out! Find your favorite Kamik boot here!